The Spring Arcade in Downtown Los Angeles is quickly earning a reputation for having practical and delicious fare; for one, there’s the all-diets-welcome Blu Jam Cafe, where the vegetarian-friendly crunchy french toast is already the stuff of LA legend, and Gelateria Uli slings some of the most popular gelato and soft serve in the city. Walk deeper under the corridor of light strings, though, and you’ll find a Hong Kong-style char siu (barbecue pork) that’s been four cities, three generations and one hungry couple in the making. 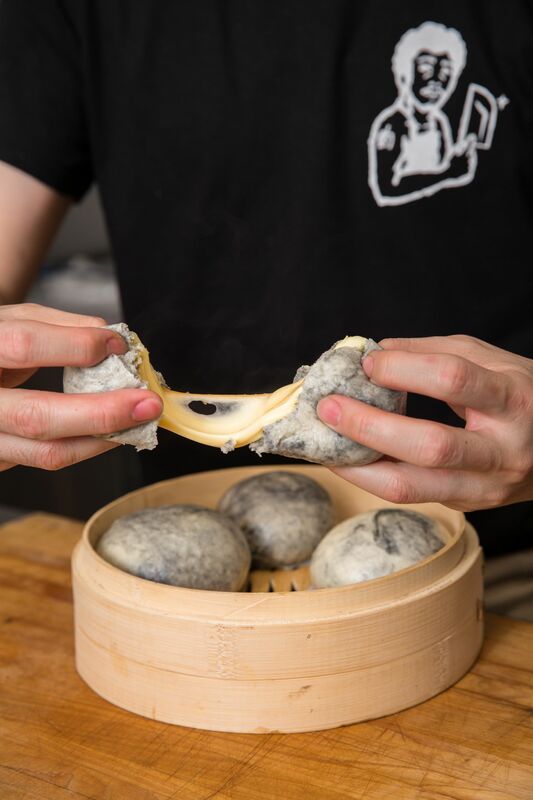 Leo and Lydia Lee are the husband-and-wife duo behind RiceBox, a Cantonese-style comfort food concept that’s all set to give Hong Kong-style barbecue a second-generation update — to some marvelous results. As for where it began: Lydia’s grandfather owned a Cantonese barbecue restaurant in Central Hong Kong for 40 years, and Leo’s family owned a Chinese restaurant in Mexico. 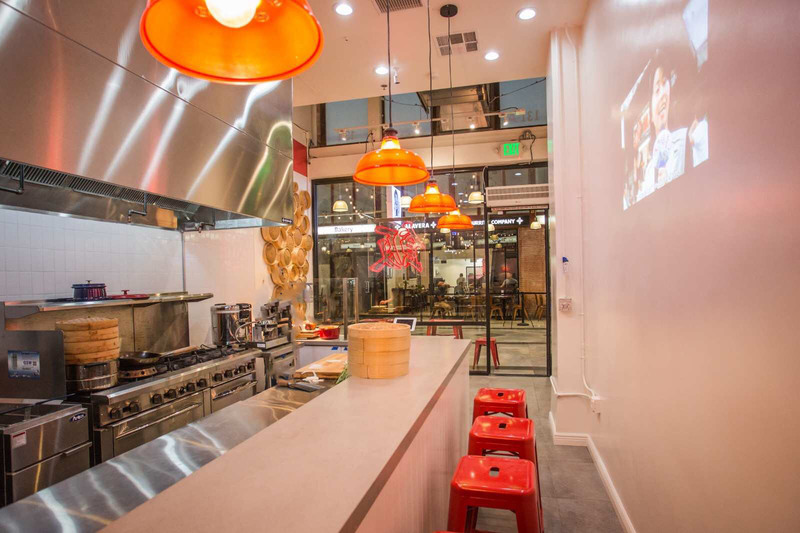 The two moved to Los Angeles, home to one of the most competitive markets for Chinese cuisine in the United States. However, even with the stunning breadth of regionally focused Chinese restaurants in the San Gabriel Valley, Leo and Lydia had trouble finding a proper Cantonese barbecue. So Lydia handed her grandfather’s recipe for char siu to Leo — who quickly went to experimenting with the dish. Even with a recipe in hand, conventional wisdom says one should never go into business with your friends and family. But Leo and Lydia are both at the storefront, and they seem to be already running the business with a comfortable command of their roles. Lydia’s warm and engaging personality hits diners at the cash register, while Leo deftly cleaves a side of char siu or blistering, crackly porchetta into uniform slices. His focus is intense, working in silence. Another element of a successful business that comes naturally in marriage is candid communication. Lydia acts as a form of quality control for Leo’s work. It was her grandfather’s recipe for char siu, after all, so she’s the best acquainted with the flavors and textures that need to be imparted by the barbecued pork. One of the more modern solutions being employed by Leo involves holding vacuum-sealed char siu in a sous vide water bath. The vacuum sealing and precision of temperature afforded by a proper sous vide circulator allows Leo to hold char siu at a proper temperature without losing moisture. It’s a bit of a hack that helps set the char siu at RiceBox apart from the drier, jerky-like renditions available at some of the more traditional char siu available in the city. The husband-and-wife synergy that gave birth to RiceBox is catalyzed day-in, day-out by Leo and Lydia’s shared love for Cantonese barbecue. 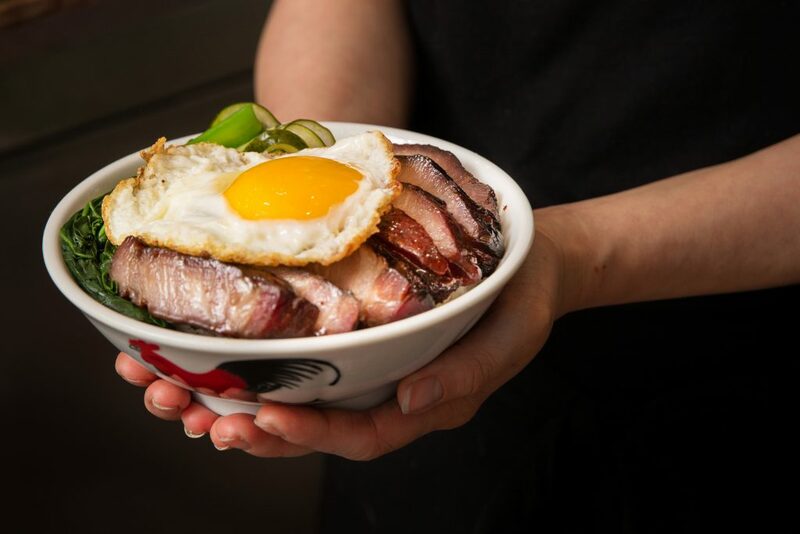 It’s only fitting that their brainchild, a so-simple-it’s-genius dish of rice, seasonal vegetables, pickles and a one-of-a-kind char siu, is something everyone in Los Angeles can love — together.